Yes Brazil Show Dance & Arts Studio Kew. 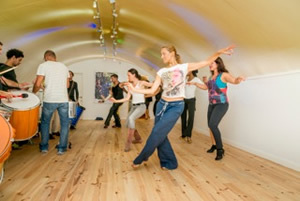 New to Kew, Latin Dance Classes – from the home of the famous Yes Brazil dance troupe and band – Studio Kew, a range Latin dance and music classes for all ages and tastes. Located under the arches of Kew Bridge by Kew Green. 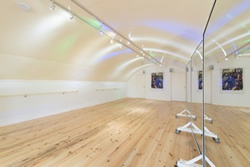 Studio Kew enables the creative dancers of Yes! Brazil to bring the Rio of Janeiro’s Carnival atmosphere alive through the dance classes. , which take place every day. 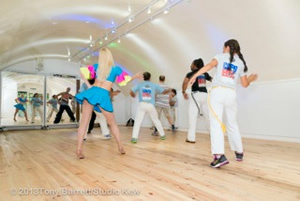 The classes offered include salsa, zumba, tango, and capoeira. Also, there are music and Brazilian percussion sessions as well taught by experienced professional teachers. Studio Kew’s story has come to live due to Yes! Brazil owners’ passion for music and dance. They started 20 years ago at the Café des Artistes in South Kensington (where The Rolling Stones performed). It all began with “Brazilian Night” and has gone from strength to strength offering exciting entertainment with a Latin American theme all over the world. People can arrive at the studio by boat from Kew Pier, by bike along the cycle way, by car or by public transport, 391 and 65 bus. The nearest stations are Gunnersbury (rail an District Line), Kew Bridge (rail) or Kew Gardens on the District Line. It has wood flooring, dance mirrors, a complete sound system, a kitchen and disabled bathroom. It can be hired by the day, the week or the hour."